Successfully Added Battery-Free Wireless Doorbell - 30m Range, 6 Volumes, 48 Ring Tones, 20000 Click Lifetime, Plug And Play Design to your Shopping Cart. Never miss out on an important delivery or visitor again thanks to this battery-free wireless door bell. Simply attach it do your door with the included sticker and you’re all set to go. No more need for toolkits and time-consuming wiring installations – this sleek and modern doorbell is ready for use the moment you take it out of the box. With its self-powered and wireless design, this doorbell is a true asset to any modern household. 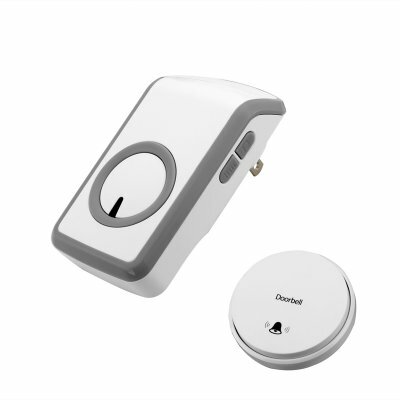 Coming with a 3M adhesive pad, the transmitter of this wireless doorbell can be easily attached to any surface. The receiver can be placed anywhere in your house as all you need is an empty power plug. Featuring large and easy to control buttons, you will be able to efficiently change the volume and chime directly from the receiver. With up to 48 different ring tones you can be assured that there always will be a tune that suits your liking. What sets this modern wireless doorbell really apart from the rest is that it features a self-powered push button transmitter. No longer you have to worry about the battery life of your door bell as this magnificent gadget operates completely battery-free. With a product life of up to 20000 clicks, you can be assured that this doorbell allows you to welcome guests for many years to come. Being able to operate in temperatures ranging from -25C to +50C, it is guaranteed that this door bell functions properly no mater where on the globe your property is located. With a range of 30 meters, the receiver of this wireless doorbell can be placed just about anywhere in your home or office. As the transmitter of this doorbell is portable, it can additionally be used as an assistance alarm for handicapped, elderly, or bed bound individuals. Simply place the transmitter within their proximity and they will always be able to ring whenever your assistance is required. This wireless doorbell comes with a 12 months warranty, brought to you by the leader in electronic devices as well as wholesale electronic gadgets..
Arabic: - جرس الباب اللاسلكية - Chinese Simplified: - 无线门铃 - Czech: - Bezdrátový zvonek - Dutch: - Draadloze deurbel - French: - Sonnette sans fil - German: - Kabellose Türklingel - Hebrew: - פעמון אלחוטי - Hindi: - वायरलेस घंटी - Hungarian: - Vezeték nélküli csengő - Italian: - Campanello senza fili - Japanese: - 無線呼び鈴 - Korean: - 무선 초인종 - Malay: - Loceng pintu tanpa wayar - Norwegian Bokmål: - Trådløs ringeklokke - Romanian: - Fără fir Doorbell - Russian: - Беспроводной дверной звонок - Spanish: - Timbre inalámbrico - Thai: - ออดไร้สาย - Turkish: - Kablosuz kapı zili - Vietnamese: - Chuông cửa không dây.